These terms and conditions shall form part of any agreement or purchase document (“Purchase Order”) to which they are attached (and these terms and conditions and purchase document to which they are attached, and the schedules, appendices, specifications, drawings and quotation documentation attached thereto shall hereinafter be referred to as the “Contract”). Purchaser’s acceptance of delivery of the Products as hereinafter defined, or execution of a Purchase Order shall constitute acceptance by Purchaser of this Contract. “Products” means all products, substances, property, equipment, parts, goods, commodities and materials that are sold by Foremost to Purchaser under this Contract. Products also include services to be performed by Foremost in connection with design, manufacturing, installation and service of Products. “Purchaser” means Foremost’s customer having submitted/executed the Purchase Order to which this Contract is attached. “Warranty Period” means the earliest of: (a) twelve (12) months from the date of first operation; or (b) 2,000 hours of operation provided that where hours are not duly tracked, (a) shall apply. 3.1 Purchaser may propose changes to Products, specifications, the delivery schedule or any other performance obligation covered by this Contract by giving written notice to Foremost and which Foremost may in its sole discretion accept or reject. Foremost shall be compensated and scheduling shall be adjusted, within reason, for increased costs, time and resources required as a result of any change. No such changes shall be binding unless set out in writing, signed by a duly authorized representative of Foremost and Purchaser. 3.2 Foremost reserves the right to change the design or specification of the Product at any time with no obligation to make such change to the Product(s) previously delivered to the Purchaser. Foremost reserves the right, subsequent to the receipt of the Purchase Order to make changes to the design and specification, or materials, which in Foremost’s opinion, are necessary to improve the Product. Purchaser agrees to accept any such modified Product in full satisfaction of Foremost’s obligations under the Purchase Order. Unless otherwise agreed in writing, Products shall be delivered and title and risk of loss shall pass Ex Works Foremost factory in accordance with provisions of Incoterms 2010. Products left at Foremost’s site in excess of 120 days after completion or termination of the agreement and without payment received by Foremost shall be deemed abandoned by Purchaser and may be disposed of in Foremost’s discretion without notice to Purchaser. 6.1 Purchaser may terminate this Contract by providing Foremost with thirty (30) days prior written notice. Purchaser shall pay to Foremost, in addition to all other monies received by Foremost as of the date of such notice of termination, an amount equal to any unpaid costs incurred or accrued by Foremost with respect to such Products, as at the effective date of such termination plus 10% of such unpaid costs. Upon receipt and clearing of this termination payment by Foremost, Purchaser shall be entitled to take ownership and possession of the cancelled Products, on an “as is where is” basis without the benefit of any warranties contained herein. 6.2 Foremost shall have the right to terminate this Contract immediately upon: (a) the Purchaser becoming bankrupt, insolvent or making any assignment for the benefit of its creditors; or (b) any invoice becoming more than ninety (90) days past due. Neither party shall be considered to be in default in the performance of its obligations to the extent it proves such performance has been prevented by an event of Force Majeure. “Force Majeure” includes, but is not limited to, natural disasters, strikes, transportation disruptions, interruptions in the supply of raw materials, acts of God or interference by governments or agencies of governments, and any other circumstances beyond either party’s direct control. Under no circumstances will lack of finances be construed to constitute an event of Force Majeure. Purchaser shall carry general commercial liability and commercial automobile insurance in each case with per occurrence limits of not less than $2,000,000 CAD which apply to the Product purchased pursuant to these terms. At Foremost’s request Purchaser shall maintain such insurance endorsing Foremost as first loss payee for at least the amount of the balance outstanding due and payable to Foremost. Purchaser shall furnish proof of insurance prior to Foremost releasing the Product. 9.1 For the Warranty Period, and as its sole and limited warranty hereunder and at law, Foremost warrants that all Products manufactured by Foremost hereunder shall unless otherwise specifically permitted, be new, of good and merchantable quality, be free from any defects and failures, latent or patent, be in accordance with the designs and specifications, and shall be free of any liens, encumbrances or claims (the “Warranty”). Foremost does not warrant fitness for purpose. 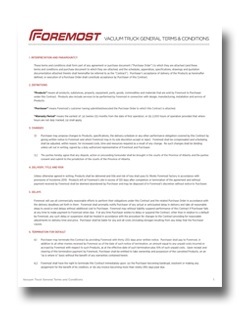 Foremost’s warranty does not cover transportation of the Product from its place of operation to Foremost’s facility for service or of Foremost service technicians to the Product to provide service. Esthetic flaws or painting and coating defects that do not impair operation are not acceptable warranty claims. Damages caused by normal wear and tear or Purchaser misuse are not acceptable warranty claims. 9.2 Foremost does not warrant that the Products it manufactures are compliant with the laws of jurisdictions outside the Province of Alberta. Foremost warrants that the Products it manufactures are built in accordance with the designs and specifications provided by the Purchaser and agreed upon in the subject purchase order. Purchaser will be responsible for ensuring that the designs and specifications provided to Foremost are compliant with the jurisdiction in which the Product will be used. 9.3 For any warranty claim of which Purchaser duly notifies Foremost during the Warranty Period Foremost, at its sole risk and expense, shall at its discretion correct, repair or replace any and all Products that do not comply with the Warranty. All warranty claims shall be in writing and in sufficient detail so as to enable Foremost to clearly identify the claims. Purchaser shall be responsible for all costs associated with returning the Products to Foremost’s facility for service or where that is not practical, any and all costs reasonably incurred by Foremost in attending the Products for servicing. 9.4 Several components, such as engines, transmissions, axles, compressors, trucks, hydraulic pumps, tires etc., which are used in the manufacture of the Product, have warranties provided by the original equipment manufacturer. Foremost does not separately warrant such items, however, Foremost will provide reasonable assistance to Purchaser to make claims for warranties as provided by such original equipment manufacturers. 9.5 Any warranty repair work shall be warrantied to the longer of 90 days, and the end of the Warranty Period. All after warranty repairs shall be subject to Foremost’s standard Parts and Services Terms and Conditions. 10.1 PURCHASER WILL INDEMNIFY AND HOLD HARMLESS FOREMOST AGAINST ANY AND ALL CLAIMS, SUITS, ACTION PROCEEDINGS (WHETHER ACTUAL OR THREATENED), LOSSES, DAMAGES, COSTS AND EXPENSES, FINES, CHARGES AND/OR PENALTIES, INCLUDING SOLICITORS FEES AND DISBURSEMENTS (ON A SOLICITOR AND HIS OWN CLIENT BASIS), NOT DUE TO FOREMOST’S BREACH OF WARRANTY, INCLUDING BUT NOT LIMITED TO BREACH OF THIRD PARTY INTELLECTUAL PROPERTY, DAMAGE TO PROPERTY, OR THE PRODUCTS, INJURY OR DEATH TO PURCHASER PERSONNEL OR THIRD PARTIES, RESULTING FROM (OR WHICH MAY LIKELY HAVE RESULTED FROM) THE USE, MISUSE, MODIFICATION, FAILURE TO PROPERLY MAINTAIN, OVER-USE, OVERLOADING OR USE IN ABNORMAL CONDITIONS OF THE PRODUCTS AND REGARDLESS OF JOINT OR CONCURRENT NEGLIGENCE OR STRICT LIABILITY OF FOREMOST (“INDEMNIFIED CLAIMS”). PURCHASER HEREBY RELEASES, REMISES AND FOREVER DISCHARGES FOREMOST IN RESPECT OF ANY AND ALL INDEMNIFIED CLAIMS. 10.2 NOTWITHSTANDING ANY PROVISION OF THIS CONTRACT OR ANY OTHER OBLIGATION OF FOREMOST, EXPRESS OR IMPLIED, TO CONTRARY, FOREMOST SHALL NOT BE LIABLE IN ANY EVENT, WHETHER IN CONTRACT OR IN TORT, TO THE PURCHASER FOR ANY INDIRECT, SPECIAL, PUNITIVE, EXEMPLARY, OR CONSEQUENTIAL DAMAGES, LOSS OF PROFIT, ECONOMIC LOSS, LOSS OF OPPORTUNITY, LOSS OF REPUTATION, LOSS OF USE, OR ANTICIPATED SAVINGS ON COSTS OR EXPENSES. IN ANY EVENT FOREMOST’S LIABILITY TO PURCHASER SHALL BE LIMITED TO THE LESSER OF ONE-THIRD OF THE PRICE PAYABLE BY PURCHASER STATED IN THIS CONTRACT AND THE FAIR MARKET VALUE OF THE PRODUCT AT THE TIME OF THE CLAIM. In addition to any lien rights that Foremost may have at law, Purchaser hereby grants to Foremost a first lien and charge, and security interest in and to the Products as security for payment of any obligation arising in connection with this Contract or any related Purchase Order, including without limitation, the servicing of the Products and which lien shall survive regardless of whether Foremost has released possession of the Products. Any deposit is a non-refundable genuine pre-estimate of liquidated damages and not a penalty if the amount of such deposit is stated in Foremost’s quotation documentation or the Purchase Order. Unless otherwise specified in the Contract, prices herein specified shall be Canadian Dollars. Purchaser shall pay proper and correct invoices submitted by Foremost pursuant to this Contract within thirty (30) days receipt of a proper and correct invoice by Purchaser. All past due invoices shall accrue interest at eight percent (8%) per annum, compounding monthly. Foremost reserves the right to require receipt of payment in full, prior to releasing any Product or vehicle on which services have been performed. Foremost may require a credit application be completed and returned with this Contract upon time of execution. Foremost’s obligation to perform this Contract or any related Purchase Order shall be subject in all respects to Purchaser’s satisfactory financial condition in Foremost’s sole discretion. Foremost may require financial security and assurances. Purchaser acknowledges and agrees that there is no transfer of any intellectual property right, including any patent right, trademark or industrial design right by virtue of this Contract or the sale of Products to Purchaser hereunder. 16.1 This Contract shall be governed by and interpreted pursuant to the laws of the Province of Alberta and the federal laws of Canada as applicable therein, without regard to its rules on conflict of laws. The United Nations Convention on the International Sale of Goods shall not apply. 16.2 The parties hereby agree that any dispute, action or proceeding hereunder shall be brought in the courts of the Province of Alberta and the parties consent and submit to the jurisdiction of the courts of the Province of Alberta. This Contract shall be construed and interpreted in the English language only. The parties confirm that it is their express wish and intention that this Contract, as well as any other documents relating to this Contract, including notices, appendices, orders, confirmations, quotations, schedules and authorizations (“Contract Documents”), have been and shall be drawn up in the English language only. To the extent that any Contract Documents are translated into or otherwise proposed in any other language, the English language version shall prevail to the extent of any of any conflict, discrepancy, inconsistency, ambiguity or difference of any kind between the English language version and any such translated version. Any such translated version shall not be considered evidence of any intention or interpretation whatsoever.